Why Are Truck Guns A Thing? It is a sad state of affairs, but we live in a world where crime happens, not the least of which is a phenomena called home invasion. While violent crime has been down considerably for the last twenty plus years home invasions are one of the exceptions. There has actually been a measurable increase in home invasions over the past decade. A home invasion is characterized by the intentional entry of the structure while the occupants of the home are present and this is known to the invaders. This crime is significantly more deadly than your average burglary, which is usually an attempt by the criminal(s) to enter the home while they believe that nobody is there. One characteristic that is quite consistent among home invasions: they happen very quickly and with little if any warning to the home owner. If you are the sort of person who is in and out of the house during the day you are probably dressed for your public activities most of your waking hours. 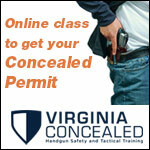 If you carry a gun when you leave the house, the simplest thing to do may be to just keep your gun on at home. We tend to get in the habit of decompressing as soon as we enter our abode. We empty our pockets and we usually remove anything we are wearing about out waist. For most folks the gun comes off as it is considered at least slightly uncomfortable. Well, certainly the combination of the right gun with the right holster goes a long way towards making things more comfortable, but this is often more a mindset issue than anything else. We tend to consider our home safe. 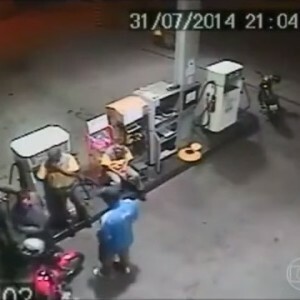 The reality remains that a very large percentage of crime takes place within residential abodes. When home invasions do happen they often involve multiple heavily armed invaders. 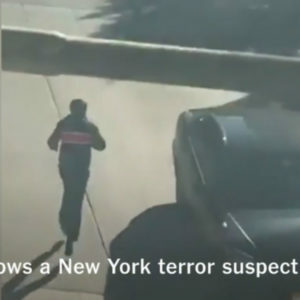 If you carry a substantial handgun throughout the day while in public you may be unfortunate enough to face a situation where that is the gun you will want in your hand when your door gets kicked in by several heavily armed violent felons. 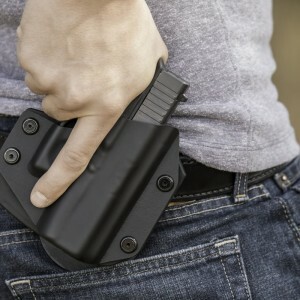 Simply wearing your carry gun in the home is a great idea if it is feasible with your lifestyle. If you are the type of person who stays dressed for the world from the time you wake until the time you sleep then you can probably just wear your regular carry setup almost all the time. However, most of us are not necessarily dressed for action when at home in the evenings or on the weekends. 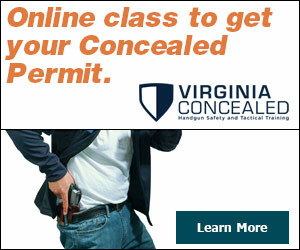 There are ways to carry a gun in fairly casual clothing. 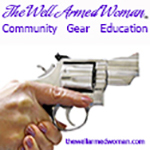 If you carry a substantial gun when out and about, and I hope you do, you might find that a small pocket pistol or revolver is a needed addition to your arsenal for home carry. A small and lite gun like one of the new 380 autos available can ride in a pocket holster in the pocket of shorts with only a draw string. Similarly, a lite weight modern revolver like a Ruger LCR or a Smith and Wesson 642 are so lite that they can be pocket carried in shorts or pants without a belt, within reason. 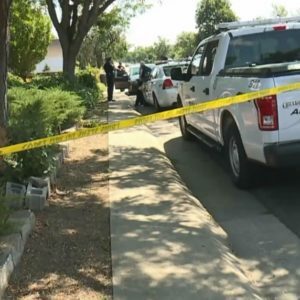 We now face the argument that we may want a more substantial pistol if facing multiple assailants in the home, no different than on the street. The balance, however, is what are you willing to carry? A lite weight 380 auto or revolver in the pocket is easy to have on you even while lounging in basketball shorts and it is a lot better than the gun still locked in the safe upstairs when your door explodes and you are sitting in the bathroom. I usually carry my usual EDC during the day even at home but in the evenings if dressed in lounge-around-the-house cloths I will typically carry my Ruger LCR in a no clip holster in my waistband. The LCR is so light that it stays put even in a pair of shorts in a Sticky holster as long as there is adequate tension on the waistband. Another option that works really well for a lot of people is pocket carry. What you will find is that a small and lite weight firearm can be pocket carried quite easily and comfortably even in very casual clothing. Home carry is one of several reasons that I believe all concealed carriers should have a very small and lite weight handgun in their lineup. 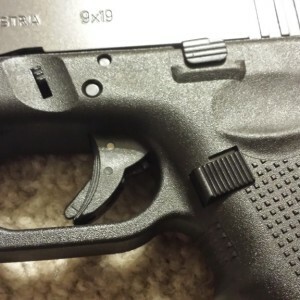 These small guns such as the 380 pocket pistols or small 5-shot revolvers are ideal pocket guns or guns that can ride in the waistband of more causal shorts or pants in no clip holsters like the Sticky or the Remora. Bear in mind that there must be tension on the waistband even for small guns in these holsters so if you don’t want to wear a belt you need to experiment and be sure your pistol stays in place. There are a significant number of assaults each year in which people are not accosted in their home, but rather right outside their home. Walking out to get the mail, doing yard work, taking out the trash, etc…, the sad reality is criminals don’t take the day off because it is not a time or place that you are expecting trouble. 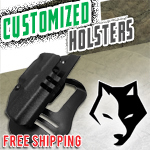 Once again, the small pocket pistol that can be placed in a pocket holster or a no clip holster is a great solution for this. 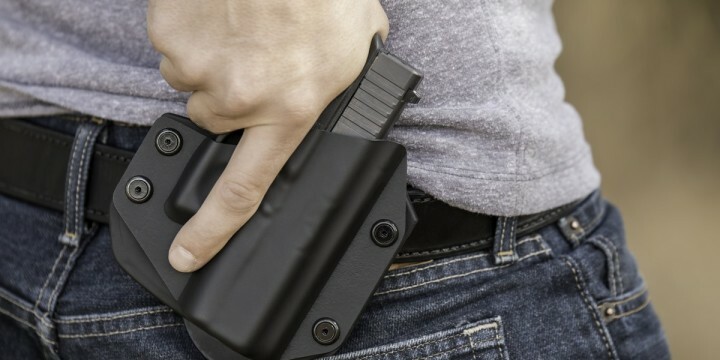 You may not want to wear a full-size gun when working in the yard, but a small gun in your pocket is certainly much better than being unarmed. The discussion of home carry tends to be depressing for many people because we like to consider our homes safe places away from the world. We must, however, accept the world for how it is and take responsibility for making our own home safe. Carrying your weapon while home is a good habit to develop. Do you use any other ways for effective home carry? Share them with us.